Emerging drenched and happy after a spin class at Hustle & Flow Fitness in Venice is a regular common occurrence. But, after a two-hour power-packed Endurance Ride with four top spin instructors, a full house of spinners shouting out in excitement and glory for the moments that rotated beneath our pedals, I have to say I finished completely waterlogged and elated. This ride was the first of many Endurance Rides to come in the future at Hustle & Flow. If you want a challenge that will push you to, or even past, a level you never thought you had in you, this is the ride for you. Each instructor took turns motivating us past burn, to breathlessness, up hills, through the grit of the flats, sprinting up hills, and beyond. There were no breaks in between, except for short “recoveries” to prepare for the next push towards greatness, or of course an occasional self-directed water break. It was our ride. And, Greg Davis, Jo Ann Mendelson, Hester Van Hooven Ward and Nicole Sciacca didn’t just take us through it. They danced, cheered, whooped and hollered, pepped talked and skillfully guided us all the way through the two-hour experience until the very last beat of the very last song. We did it together and it felt amazing. Spin instructors Jo Ann Medelson, Hester Van Owen, and Nicole Sciacca (owner) all smiles and still lovely after leading Endurance Ride at Hustle & Flow Fitness. Greg has a way of focusing the riders attention immediately, to kick into the inner and external strength that lies within us. I was locked in with his guiding words and soon wet with the sweat pouring out of my skin. Next to me, 20 minutes into the ride, Nicole suddenly dawned a towel wrapped turban around her long dark hair, completed by her beautiful unabashed smile. Jo Ann danced her way through her whole segment, bopping to the tunes she provided. Even if any inkling of an urge to back down crept into my mindset, I’d look at her boundless energy and quickly kick back into gear. It was not time to give up. Then Hester took the helm. Her soulful exuberance and free spirit drove the pace she set, her wisdom carrying the words used to encouraged a positive perspective, fine-tune our body positions, and get us fully into each phase of her ride. Nicole’s finale took me beyond where I ever thought I’d go. After already accomplishing three-quarters of the total ride, I felt opened up, ready for and trusting of whatever she was about to give us. It was almost over. What else could happen? But, Nicole did not let up. Fast paced Tabatas took the main stage on her ride, along with 5 long inclines. In and out of the saddle, Nicole prompted us to crank the gear a little, and a little more, and to crank the gear a little more again. As soon as I thought I had tapped out, she’d ask again, and I would follow suit, only to discover that I could do more than just take it – I was loving it. We all were. The short increments and super positive energy gave us all an incredible feeling of accomplishment at the finish line. 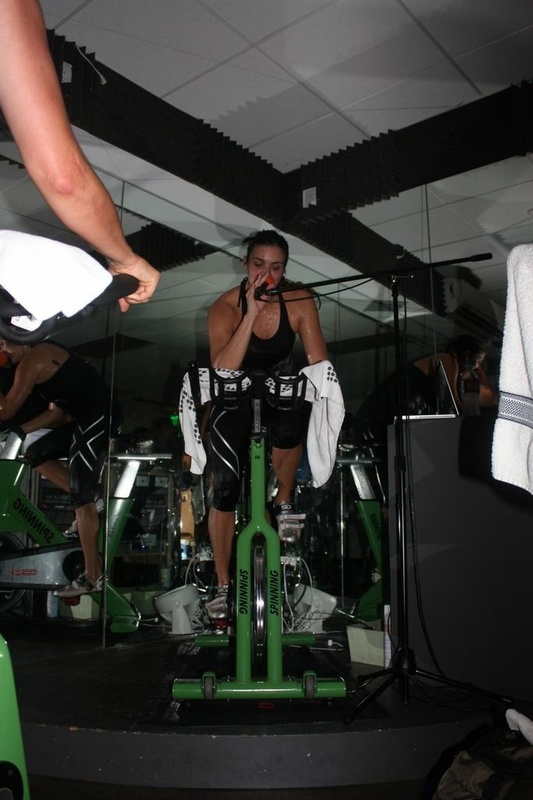 Catch the next Endurance Ride at Hustle and Flow Fitness on December 15th from 12:45-2:45. Or, just walk into this lovely boutique fitness studio on Abbot Kinney and simply pick up a week long pass. 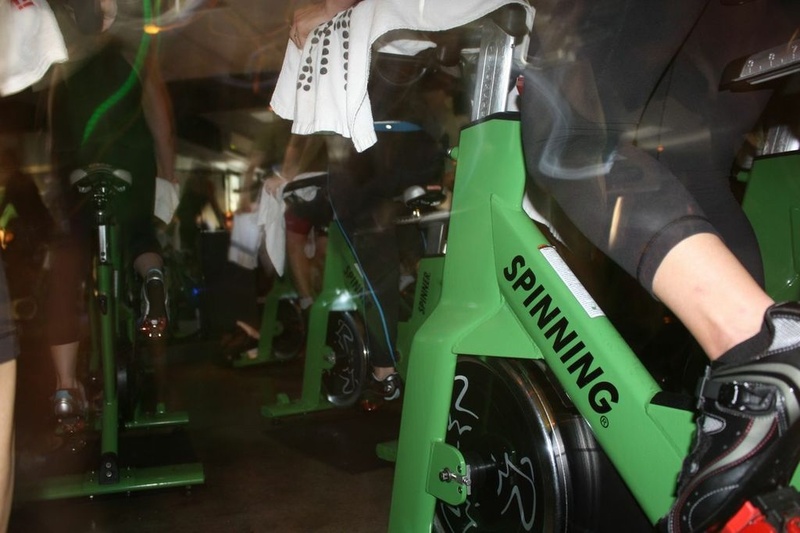 You’ll be able to indulge in a myriad of spinning and yoga classes for a mere $30. Both options are a great way to sample the classes and instructors. You’re sure to find that each instructor brings their own feel, groove and personality to the head of the class. What I love about Hustle & Flow instructors is that although they are all beautifully unique, they all exude a certain empowerment, grounded in nature, and a joyful light that is easy and inspiring to connect too. And their fearless leader, Nicole Sciacca, playfully leads the charge every day. I always feel personally welcomed into their space and totally revved up from the second we begin each class. I know you will too. This sounds fun, but exhausting. Glad you are up for this already. You have one typo “2o minutes into…” The o should be a 0. Unless I don’t get it.